A leech field and a septic tank are two different parts of a complete septic system. The bacterial action that breaks down waste materials takes place in the septic tank. Sewage products that are reduced to a liquid effluent are transferred to the leech field and carried out to be absorbed into the soil. The septic tank and the leech field provide a method for disposing of sewage in an environmentally acceptable manner. A complete septic system provides a means to dispose of human waste in areas that do not have a sewage system provided by a local government or private homeowners association. The septic tank stores solid waste products that are not reduced to liquid effluent until you have them pumped out and disposed of properly. The leech field is a series of perforated pipes that provide an effective means for disposing of contaminates without endangering animals or contaminating the ground water. Septic tanks are large concrete or stainless steel boxes placed in the ground at least 10 feet from the house. The top of the tank is usually no more than 1 foot below the surface of the ground. The septic tank is connected to the leech field by a distribution box, which allows the effluent to flow out through leech pipes called laterals. The leech pipes are laid in trenches lined with gravel and a layer of untreated building paper that functions as a soil filter, allowing the effluent to gradually be absorbed by the soil. Prior to installing a septic system a soil technician will conduct a percolation test to determine if the soil on a building site will be suitable for a leech field. 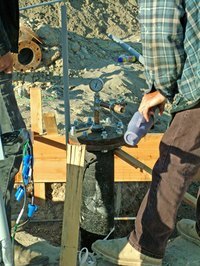 The percolation test evaluates the ability of the soil to absorb the sewage effluent. The leech field should be located 100 feet from a well or a pond. If property constraints limit the available distance from water sources, the leech field should not be constructed uphill from the well. Leech distances also apply to your neighbor's well and ponds. Undigested solid waste that settles to the bottom of the septic tank forms a sludge that builds up over time and will eventually clog up the system. Depending on the size of the septic tank and the usage, the system should be pumped out every two to four years. Homeowners should not dump hazardous chemicals down the drain. Hazardous chemicals destroy the bacterial process that breaks down solid waste. Also, heavy vehicles should not be driven over the leech field or the septic tank since this can seriously damage the system. Septic tanks are used in rural areas and unincorporated residential subdivisions all across the country. According to the U.S. Census Bureau, "about 26 million homes (one-forth of all homes) in America are served by decentralized waste water treatment systems." A major consideration when building a new home in a rural area is the suitability of the land for a septic system. There must be sufficient land to support the size of leech field that will handle your family's waste disposal needs.